Mulk Raj Anand. CURRIES AND OTHER INDIAN DISHES. Desmond Harmsworth, London 1932. An early work on the subject. 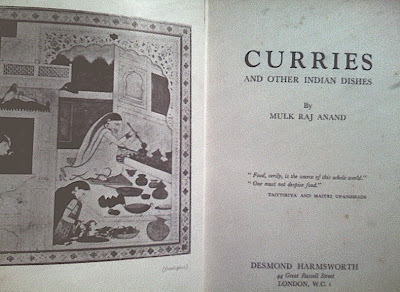 Indian restaurants were rare in England in the 1930s. The only one I can trace is the still extant Veeraswamy's (established in 1926 off Regent Street 'by the great grandson of an English General, and an Indian princess.') A customer recalls going there in the 1940s when it was full of Colonel Blimps and an electric Punka was in operation. A current photo of its interior (below) reveals an opulent and sedate dining area, not suitable for poppadum frenzy or vindaloo excess. In America Indian restaurants were uncommon until the 1980s. I recall that there was not a single Indian curry to be had in Los Angeles in 1975; there may be now as may as a 100 such restaurants in the city and the suburbs of L.A. Carefully pick the stones out of the dal and soak for about an hour in a panful of cold water. Put it to boil in a panful of boiled water. Sprinkle in some salt and turmeric and stir. When the lentils are tender, fry the sliced onion in melted butter with black and red pepper in a different pan. Pour this fried mixture into the pan containing the dal to the consistency of porridge over a gentle heat. Take care while putting in the butter to keep the lid partly on so that the liquid does not fly back to your face and hands.